I think it’s the groove that kicks off “Revolution Blues” that ties the noose, as if I’ve just downed a Rohypnol-laden cocktail and am no longer the one calling the shots. 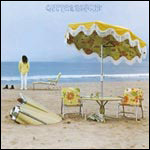 From that song on, Neil Young’s album On the Beach refuses to let up. The subsequent tracks keep the “jive alive,” and you are locked within the doped-up trance, long after “Ambulance Blues” fades away into a swirl of western dust. The album is reminiscent of what makes Everybody Knows This is Nowhere and Tonight’s the Night (among others) so perfect in every way, the way the songs build off one other. And the magic isn’t limited to Neil’s hypnotic finger pickin’ banjo, golden strum, or the distinct hard driving dinginess of his electric guitar. There is also the landscape that contributes to the consistent vibe. It is a rich atmosphere, laced with a lyrical loveliness that lends itself to stories compelling and real. So I guess if I was forced to pick a favorite Neil Young album and was allowed to preface my choice with the disclaimer that it is merely my favorite right now (today), I’ll lay down On the Beach and let myself drift into its despair. If you want to disagree, by all means, have at it. After all, in the arena of such subjective discussions, Everybody Knows This Is Nowhere.